HDMI is the most common audio/video connection in use. However, TVs may have as few as one or two, or at most, three or four HDMI inputs. If you have a lot of HDMI-equipped source devices, such as an upscaling DVD/Blu-ray/Ultra HD Blu-ray player, cable/satellite box, media streamer, and game console that all need to be connected to your TV, there may not be enough HDMI inputs, but don't panic! An HDMI switcher is a device that expands the number of HDMI sources you can connect to your TV (or video projector). 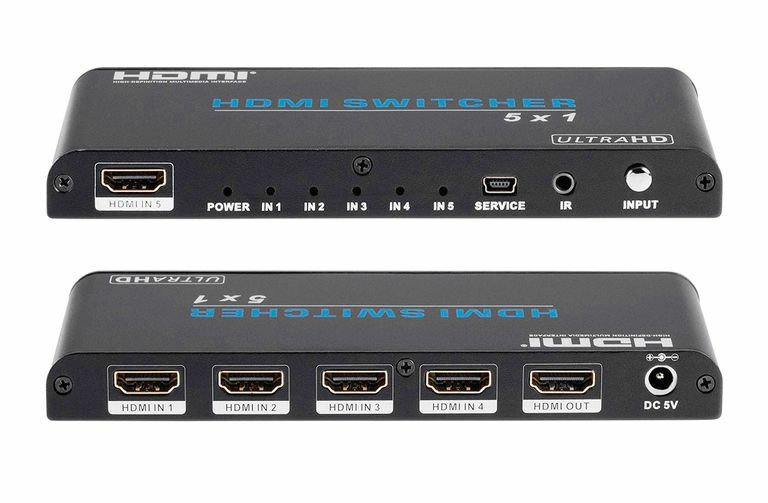 The number of HDMI inputs on a switcher may range from 2 to 8. Connect your source(s) to the switcher's HDMI inputs and connect the switcher's HDMI output to your TV or video projector. Some switchers have two HDMI outputs. This allows the connection of the same source to two video displays (such as two TVs or a TV and video projector) or separate sources to each video display (an HDMI switcher with this capability is usually referred to as a Matrix Switcher). On HDMI switchers with two HDMI outputs that send the same video signal to two video displays, if one of the displays has a lower resolution (e.g. one is 720p and the other is 1080p, or one is 1080p and the other is 4K), the output from the switcher may default the lower of the two resolutions for both displays. HDMI switchers plug into AC power and usually come with a remote control for more convenient source selection. Some HDMI switchers also incorporate HDMI-CEC support, which allows the switcher to automatically go to the correct input of the most recently activated device. HDMI switchers currently available for consumers are at least 1080p and Dolby Digital/DTS compatible. If you have a 4K Ultra HD TV and 4K source components, the switcher also needs to be 4K compatible. If you need to pass HDR-encoded and/or 3D video signals, your HDMI switcher needs to have those capabilities. As mentioned above, all HDMI switchers pass standard Dolby Digital and DTS Digital Surround audio signals, but if you are routing the output of the switcher through a home theater receiver (instead going directly to the TV) that provides decoding for advanced audio formats, such as Dolby TrueHD, Atmos, DTS-HD Master Audio, DTS:X, you need to make sure that your HDMI switcher is compatible. The switcher also has to support HDMI handshake requirements that are implemented via either the HDCP (High-bandwidth Digital Copy Protection) or HDCP 2.2 for 4K devices protocol between source devices and the TV or video projector. This is important when switching between devices, as there is a temporary break in the handshake until the newly selected device locks in with a new handshake. Another HDMI switcher option combines both wired and wireless connectivity. There are several that will accept two or more HDMI sources, but on the output side, may include both a physical HDMI output, as well as wireless transmission to one, or more wireless receivers than use an HDMI output to connect to a video display. This solution is one way to reduce HDMI cable clutter over a longer distance. However, just as with wired switchers, the wireless transmission feature needs to support the video and audio capabilities (resolution, formats) that you require. Examples include products from Nyrius and IOGEAR. Don't need an HDMI switcher, but want to send the same HDMI signal to two TVs or a video projector and TV? As mentioned above, you can use an HDMI switcher with two HDMI outputs, but if you don't need a switcher, you can use an HDMI splitter. HDMI splitters that send two, three, four, or more signals from a single HDMI source are available, but for consumers, two is usually enough. Splitters with more outputs are mostly for business and commercial use where one source needs to be sent to multiple TVs or projectors. Splitters can be powered or passive (no power needed). It is best to use powered splitters to avoid handshake or signal loss issues. The splitter also has to be compatible with the video and audio signals you may need to pass-through. Just as with a switcher, if one video display device is a lower resolution than the other, the output for both may default to the lower resolution. If you've run out of HDMI inputs on your TV, adding an HDMI switcher can expand the number of devices you can access. However, factors such as the number of inputs and outputs and the capability to pass the needed video and audio formats will determine which HDMI switcher is right for you. Now that you know what an HDMI switcher is, how it works, and what to look for, check out some possible choices.